Click Here - To see how Greenwood County evolved each decade - includes all the known towns and villages. Click Here - To view the significant Education events for Greenwood County since the county was formed. Click Here - To see the known battles/skirmishes in Greenwood County during the American Revolution. Click Here to go to the official website of the Greenwood County government. Click Here to learn more about the known airports / airfields in Greenwood County. Created from portions of Abbeville and Edgefield counties on March 2, 1897, Greenwood County claims a distinguished century of its own as well as a share in the earlier history of older counties. Before Spanish adventurers arrived in South Carolina in the sixteenth century, the rolling hills of the piedmont offered abundant game to Cherokee, Creek, and Catawba hunters. The first European settlers in the region were Indian traders and cattle drovers, followed by Scots-Irish farmers who poured down from Pennsylvania. About 1750, Robert Gouedy established a plantation and store on the Cherokee Path at a place called Ninety-Six, a name inspired by an estimate of the distance to Keowee, a principal Cherokee town. A village of Ninety-Six, established in 1769 as the judicial center of the backcountry in the newly-created overarching Ninety-Six District, was the scene of the first Revolutionary War battle in the South on November 19-21, 1775. Later a British fort at Ninety-Six was under a siege directed by Major General Nathanael Greene from May 19-June 21, 1781. The British abandoned and burned Ninety-Six in the summer of 1781, but the town was reborn as Cambridge in 1787. 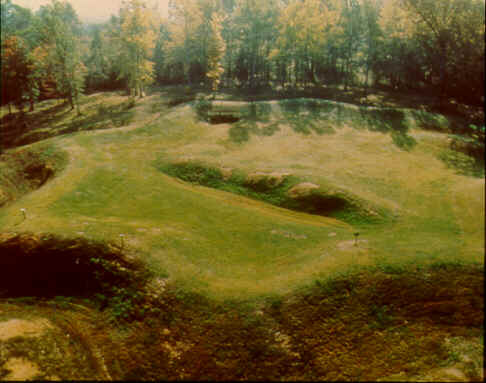 Today the Ninety-Six National Historic Site protects the British Star Fort and other features of the colonial and Revolutionary era. The American Revolution produced many heroes. A local planter, Francis Salvadore, was the first Jewish American elected to a representative assembly and the first Jewish Patriot to die in the cause of independence. Greenwood, the eventual county seat, grew up around a log house built in 1823 by Cambridge lawyer John McGeehee. In 1852, the Greenville & Columbia Railroad shifted the village center as businesses clustered around the new depot. The town became an agricultural market and transportation hub served by five railroad lines and with a population that grew to 4,828 by 1900. The Greenwood region was a hot-bed of states' rights agitation in 1860 and town father John Henry Logan is credited with proposing the famous Abbeville secession rally of that year. The village escaped most ravages of the American Civil War, but about sixty residents served in Confederate regiments. The area figured in a dramatic episode at war's end when President Jefferson Davis, fleeing from Richmond, spent the night of May 1, 1865, at the Cokesbury home of General Martin W. Gary. President Davis was captured at Irwinville, Georgia, a week later. Recovery from the effects of the war was a long and difficult process, but Reconstruction brought educational opportunities to local freedmen with the creation of Brewer Normal and Industrial School in Greenwood and Payne Institute in Cokesbury. The South Carolina Land Commission achieved a rare success with the community of former slaves called Promise Land. The rise of textile manufacturing in the New South altered the economy and society of the region. The first cotton mill in Greenwood opened in 1890 with 75 workers. When it nearly failed in 1908, James C. Self became president of Greenwood Cotton Mill and built one of the largest privately-held companies in the industry. Abney Mills, based in Greenwood, spread its production plants across the upstate. On the northern border of the county, investors launched the Wares Shoals Manufacturing Company, located on the Saluda River. This enterprise soon encountered financial difficulty and was sold to Benjamin Riegel of New York. He completed the unfinished mill and constructed the model textile town of Ware Shoals. The Great Depression altered the economy and landscape of Greenwood County. Farmers were impoverished, land values declined, local textile mills struggled to survive and to resist union efforts to organize the workers. After 1933, New Deal programs offered limited work relief for the unemployed. The largest New Deal project in the area was construction of Buzzard's Roost Dam on the Saluda River to impound Lake Greenwood and generate electricity in a county-owned power plant. Today the hydroelectric plant has been sold to Duke Power Company while the lake offers an array of recreational facilities. Since 1950, Greenwood County has experienced diversified industrial growth with construction of new factories by major corporations such as Monsanto, Velux, and Fuji. But the county remains home to a unique mail order business, the George W. Park Seed Company, whose research and development division is on the cutting edge of science and technology, including experimentation aboard the Space Shuttle. The history of Greenwood County extends from the colonial frontier of the eighteenth century to the new frontier of space research. The citizens of the county take pride in their commitment to remember the past and to build for the future. 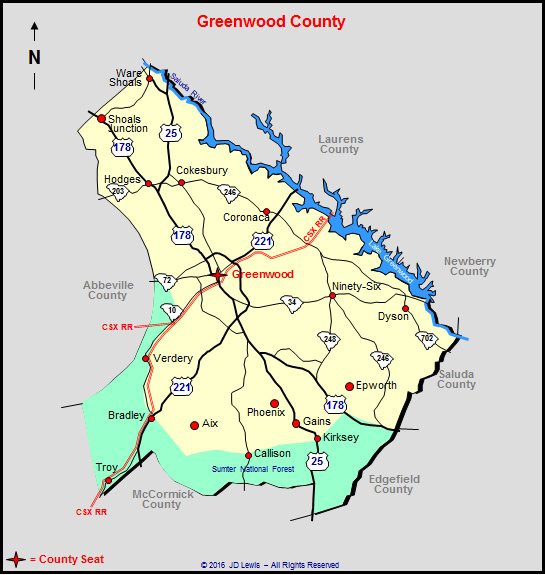 Greenwood County takes its name from its county seat, Greenwood. The town of Greenwood was named around 1824 for the plantation of an early resident, John McGehee. Greenwood County was formed in 1897 from parts of Abbeville and Edgefield counties, which were originally part of the old Ninety-Six District. This part of the backcountry was not settled until the mid-eighteenth century. The town of Ninety-Six was established as a frontier trading post around 1730, and it was the site in November of 1775 of one of the first South Carolina battles of the American Revolution. In May and June of 1781, American forces besieged the British-held Star Fort at Ninety-Six for over a month but were forced to withdraw when British reinforcements approached. The arrival of the railroad in 1852 stimulated cotton growing and textile manufacturing in this area. Local plantation owner Francis Salvador (1747-1776), who was killed fighting Cherokees during the Revolutionary War, was the first Jewish person elected to the state legislature. United States Congressman Preston Smith Brooks (1819-1857) and educator Benjamin Mays (1894-1984) were also residents of Greenwood County. Although the site of the first white settlement in piedmont South Carolina, Greenwood County was not organized until 1897. It was formed from Abbeville and Edgefield counties, original sub-divisions of the old Ninety-Six District. 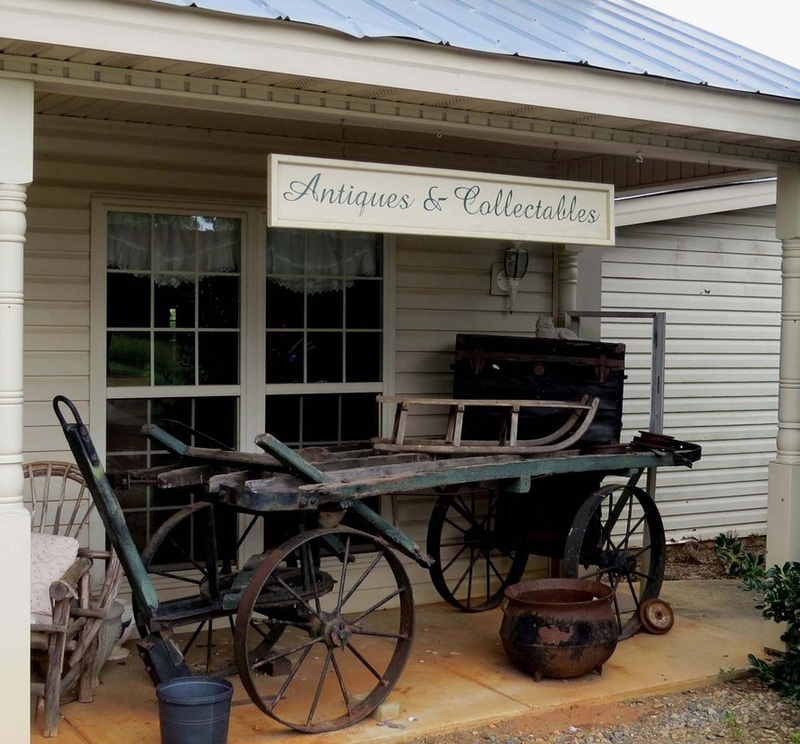 A piedmont country county, Greenwood is situated on a ridge between Saluda River on the east and Savannah River on the west, though it touches only the Saluda, Abbeville intervening between it and the Savannah. The area is 473 square miles and the population, estimated as of 1925, is 36,969. The county is admirably adapted to farming in staple, truck, and fruit crops. The lower and middle sections are for the most part of the much desired chocolate soil, selected by early settlers for its great dependability in all sorts of seasons. The upper section has two grades of soil. Around the villages of Hodges and Cokesbury a sandy loam grows line staple crops, melons and, in former times, produced excellent tobacco. This section attracted national notice some years ago because of the transformation wrought in production by the use of crimson clover. This sandy loam produces a bale to the acre of cotton after crimson clover with only a small amount of acid phosphate as commercial fertiliser. The other part of the upper section is strong red and sandy soils mixed. Around Ninety Six, a thriving town in the lower section, grain crops have been produced which rank with any yields in the state. A creamery at Greenwood, the county seat, encourages the use of cattle on farms and nearby markets could use much more milk than is now supplied by dairies. Pioneer poultry men are finding the soil and climate just the thing for that business. Four railroads (total mileage 101) enter the county, Southern Railway, Seaboard Air Line, Charleston & Western Carolina Railway (part of the Atlantic Coast Line) and the Piedmont & Northern Railway (electric) with a fifth now assured, the Georgia & Florida Railway extension from Augusta to Greenwood [completed in 1929]. These railroads with nine highways radiating from the county seat, five to be paved in the state system, make the county one of the most easily traveled of the state and its county seat one of the leading distributing centers. The highways include the nationally known Dixie, Calhoun, Black Bear, and Capital-to-Capital, with others connecting county seats of adjoining counties. At Greenwood, the county seat, are Lander College, Bailey Military Institute, a high grade military preparatory school, and a city school system including a modern high school. The city schools last year enrolled 4,500. There are three other high schools in the county. Four hundred thousand dollars was spent in public school buildings in the county in 1926. Greenwood, with about 250,000 spindles, is one of the leading cotton manufacturing counties. It has large mills at Ware Shoals on the Saluda River, at Ninety-Six and in Greenwood. The annual payroll approximates $3,000,000. Greenwood ranks second in the state in the per capita value of its manufactured products. The value of all crops, payrolls, and manufactured products in 1924 was over $15,000,000. The county has nine banks with resources of more than $8,000,000. The first white settlement in upper South Carolina was at old Ninety-Six in this county. There was the site of the first court house in the piedmont country and the spot where the first blood for liberty in the state of South Carolina was shed, on November 19, 1775. A monument erected by the D.A.R. commemorates the facts. Land is reasonably priced in all sections and no farm in the county is further than two miles from a topsoil highway. The county has had a county farm agent for 15 years, has a home demonstration agent and a chamber of commerce with offices at the county seat. The county and the city of Greenwood maintain a public library with over 5,000 volumes. Home seekers will find Greenwood County a place of congenial people and a section with almost unlimited opportunities for making a livelihood and enjoying life to the full. Click Here to view / download a 2016 Road Map of Greenwood County, SC. Adobe PDF file. Fairly large.